This post has 434 views. I watched Summer Wars a couple of weeks ago, but I didn’t get around to writing about it due to me being lazy and busy at the same time. Summer Wars is of course the Mamoru Hosoda anime film about a math whiz and his upperclassman’s entire extended family trying to stop an errant program from crashing both a popular virtual world and the real world. Even though I’ve put this post under the “Reviews” category, this post is just some random thoughts I feel like writing down after watching the movie. Writing a well-versed and structured review just feel like too tall of a task for me these days lol. – The scenario in Summer Wars is precisely why certain things such as emergency dispatch, satellite control and other important infrastructure services should not be connected to a network that everybody has access to. The movie is part social commentary about how people have to be connected to the net these days and how more and more services rely on the internet as well. The scenario in the movie sounds a little farfetched right now, but who knows what’ll happen 20 or even 10 years down the line. Let’s just hope all the technical people who are designing these networks and services always keep security in mind. – The design and animation of the virtual world was quite appealing. It was clear that it was a “virtual” gathering place with the cartoonish avatars, but it was bright, organized and imaginative. The computer-aided animation was fluid and great to watch, and it helped to differentiate the virtual world from the real world in the movie. However, my only trivial nitpick about this is that even though we the audience see the virtual world in this immersive form, the characters in the movie are seeing it through their cell phones and computer screens and so they aren’t really seeing what we are seeing and therefore there is a little bit of a disconnect there. All the cool battles we see on the movie screen doesn’t quite happen that way in the movie world. – I was impressed about how the family matriarch Jinnouchi was able to get things done better with her phone book and rotary dial phone than all of her descendants (who appeared in the movie) combined. The old lady may not use internet or even a touch tone phone, but she is definitely well-connected especially when it came to people connections. – While the final battle was kind of fun, I thought the spotlight was divided among too many people. I know the “big family” is supposed to be a theme for the film and as such all the family members in the film plus Kenji should contribute to saving the day, but having Natsuki win the card game, Kenji solve last ditch math puzzles and then Kazuma delivering the final blow was dragging things out a little too long. 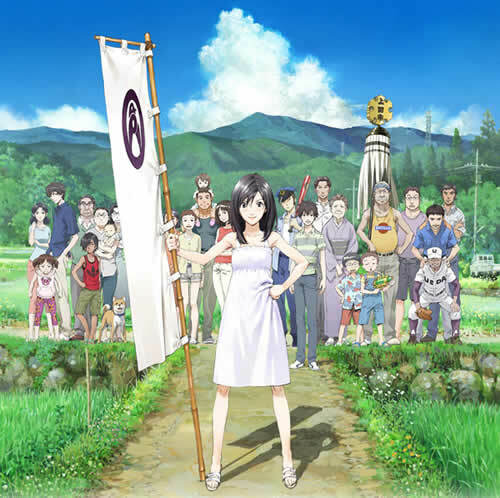 – Overall, I enjoyed watching Summer Wars, although I like Hosoda’s earlier work The Girl Who Leapt Through Time a bit more. The Girl Who Leapt Through Time was focused on its main character Makoto and her relationship with her two friends, while Summer Wars was more about Natsuki’s family in its entirety, and I guess I prefer the former setup where a smaller number of characters are fleshed out. – Lastly, I wish it was summer right now. It’s getting a bit cold where I am right now and will only get colder as winter rolls around. Summer might be a little too hot sometimes, but it’s still than freezing in subzero temperatures.